We started by setting up a Trello board and shared with staff involved. We then created columns for different parts of the recruiting process; a column for candidates, a column with all steps in our process and a column for recruiting reference material with links to Google Docs. The benefit of this system (as opposed to the example board linked above) is that you can see at a glance the status of each candidate by how complete their checklist is. 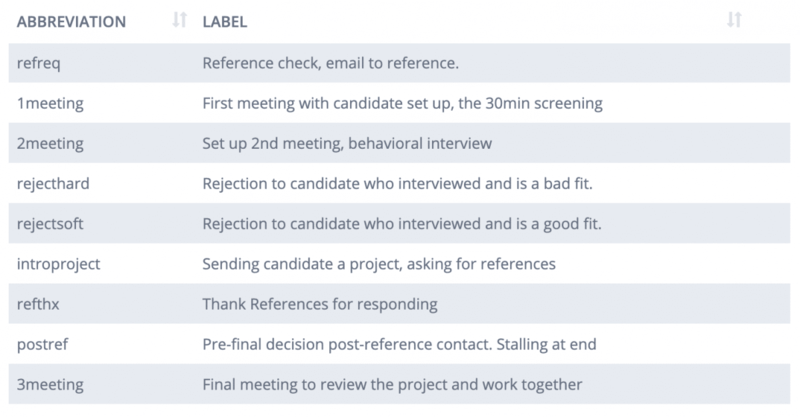 The sample board linked above uses each column as a stage in the hiring process, with the candidates traveling along the columns as they progress. We do it a little differently: we keep candidates in one column and instead use a checklist for the stages. An important part of any recruiting process is knowing the best practices for finding golden candidates. We compile all our notes on recruiting in a handy Google Doc, which covers everything from where to find candidates to interview guides. This is also where we develop job descriptions, ready to advertise. Bonus tip: We have a Trello column with links to all the hiring knowledge we’ve gathered, so it’s easily accessible to everyone. Read more on on creating cards by email on the Trello support page. From there, you can select where on the board the new card will be created. When an email is forwarded to your Trello board’s email address, the email will become a card; the body copy will appear in the description and any attached files, such as resumes, will be included as an attachment on the card. From there, we add a checklist for the hiring stages, which will turn green when completed. This is super useful as we can see at a glance where candidates are in our process meaning this first column acts a dashboard for candidate progress. To send personalized emails quickly, we use our very own TextExpander snippets, which allow us to expand longer text just by typing a short abbreviation. We have snippets for every stage and outcome of the hiring process, and the fill-ins make it easy to personalize. Fill-ins are really useful in recruiting emails as they allow you to personalize for each candidate. TextExpander: Sharing Snippet Groups with a Team. We found someone we like! Next up, interviews. We use Go To Meeting to record the interview for easy reference later. It’s useful to have the file for our records, plus we can use it to get a second opinion on a candidate and in interviewer training. We’ll have a Google Doc in front of us too with our interview notes to guide questions and record answers. We find Google Docs works particularly well because notes can be scrolled through post-interview, which is better than trawling through hours of video. Once the interview is over, we include a link to the interview notes on the candidates Trello card for easy reference. Once we’ve replied, we’ll update the Trello card with whether the candidate was successful or not, and the candidate’s card can be marked as completed. We’re enjoying using Trello and making use of Google Drive and TextExpander snippets to aid our recruiting process. They work well together! What does your recruiting system look like? Let us know @TextExpander and in our group on Facebook.